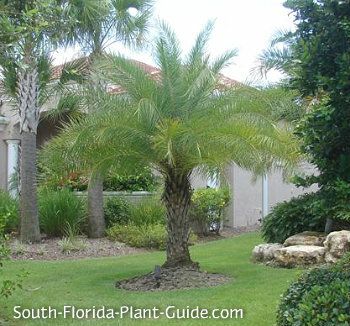 The classy sylvester palm is very hardy and low-maintenance - and just the right size for most home landscapes. 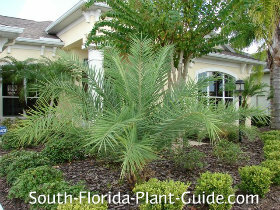 Looking like a more compact, silvery version of the Canary Island date palm, the sylvester is a good choice for homeowners who like the looks of the Canary but don't have the room. One of our prettiest cold hardy palms, it produces an edible fruit (said to be sweet) and the sap from flower stalks is used to make an alcoholic drink in the palm's native India (hence the common name "Toddy Palm"). Sylvester palms are slow growers to an ultimate height of 40 feet. They stay low to the ground while young, eventually growing an attractive trunk with diamond-shaped leaf-base scars. You can have this "diamond cut" done by a pro to get the best results. This palm is very cold hardy - taking Zone 9 temperatures in stride. It's also drought-tolerant as well as moderately-salt-tolerant. The silvery blue-green fronds are a nice contrast to other, more typical greenery. Add top soil or peat humus to the hole when planting. Fertilize 3 times a year - in spring summer and autumn - with a quality palm fertilizer containing micronutrients. 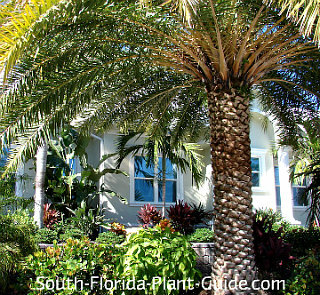 Although these palms are drought-tolerant once they're established, water during dry spells if you don't have irrigation. 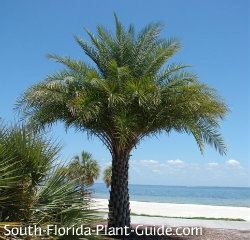 Trim browned fronds as needed - which won't be often since the palm grows slowly. Give this palm a good amount of room to spread out. Plant about 5 feet from the house. The bushy fronds have stiff, pointy leaves with spines along the stems, so keep a safe distance from drives and walkways...at least 5 feet. 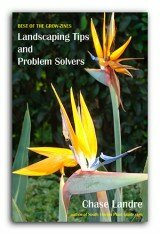 If you're planting several in a row, place them 4 to 5 feet or more apart. These palms are too wide and spiky for containers. COMPANION PLANT SUGGESTIONS: Low growers that like it on the drier side, such as Indian hawthorne, Drift rose, crown of thorns, jasmine minima (Asiatic jasmine), dwarf bougainvllea, and carissa.